The Formula Ford Association would like to thank all of you for your continuous support of our category and give you an update of the latest news in Formula Ford racing in Australia. The 2019 50th-anniversary celebrations commenced with more than 50 FF1600 (Kent) cars supporting the 2019 Liqui Moly Bathurst 12 Hour. Everyone enjoyed a very successful meeting at Australia's fastest race track (read more). 50th Anniversary photo shoot (main straight). Qualifying and races photos (Friday to Sunday). Parade laps - including former Australian Formula Ford champions Bruce Connelly, David Roberts, David Reynolds and Tim Blanchard. We would like to send a huge thank you to Anthony Mann (FFA Classic Formula Ford representative), Richard Williams (VHRR) and Steve Duggan at SD Pics for making the anniversary photo shoot possible. During the weekend at Phillip Island, Grant Rowley and Andrew Van Leeuwen put together an awesome video documentary that really captures the spirit of Historic Formula Ford. If you haven't watched it yet or would like to watch it again the video can be found at this link. The next event for Historic Formula Ford is at Mallala Motorsport Park on April 27-28. Entries for this event are now closed. We would also like to remind our FA and FB competitors that entries for Historic Winton on May 17-19 will close next Friday 19th April. Entries for Sydney Classic in June opened this week in the CAMS Event Entry system. To find out how to enter for any of the events above please head to the Entry Forms page on our website. 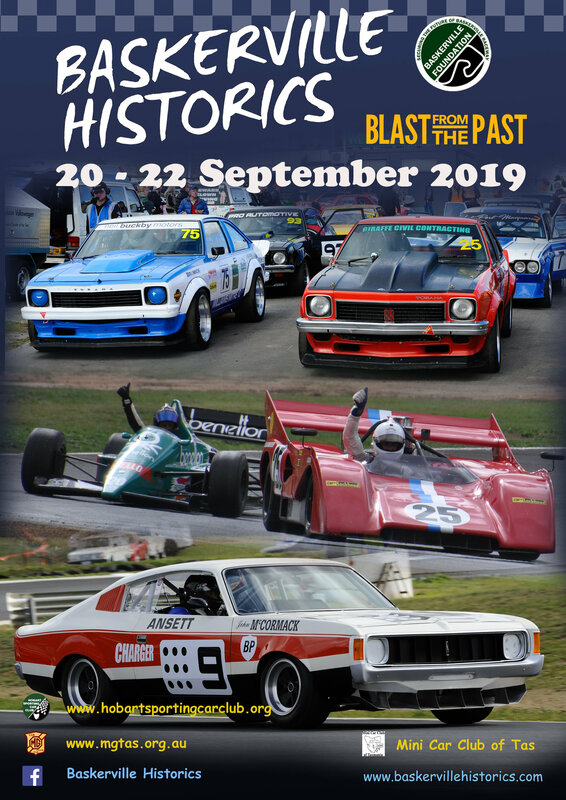 The organising committee of Baskerville Historics have approved to subsidy the entry fees for the first 10 Historic Formula Fords to enter the event from interstate. Competitors are to enter and make payment for their entry ($300) and marquee space ($400) as per the normal entry process. Upon arrival at the event with their vehicle, the first 10 Historic Formula Ford entries from interstate will receive a cheque to reimburse their entry and marquee fee ($700). This event will be held on September 20-22 in Baskerville, Tasmania. If you would like to participate in this event the Expressions of Interest form can be downloaded at this link and will then need to be sent to Donald Potter (0447 315 114) or Bronwyn Zuber (0419 569 156). The promoters of the event have also organised a practice day at Symmons Plains for all interstate competitors. This will be free of charge and will be held on Monday 23rd September. James Lambert is also organising shared transport via Searoad Mersey leaving Port Melbourne on Monday 16th September and returning from Devenport on Tuesday 24th September. If any of you are interested in participating in this event or need further information, please feel free to contact Donal or Bronwyn. For more information about the shared transport opportunity please contact James. The Australian Formula Ford Championship and Australian FF1600 Championship started last weekend at Sydney Motorsport Park (video recap available here). Tom Sargent is currently leading the Duratec class (read more), while Jarrod Costello is topping the Kent standings (read more). Both championships are now heading to Queensland Raceway for round two on May 3-5. Entries for this event are open and will close on April 24 at 5pm AEST. Click here for more information on how to enter for this event. This year the Australian Formula Ford Championship will return to the Winton Super Sprint (Supercars round) on May 24-26. Entries for this event will open soon and will be open to all Formula Ford and FF1600 cars. To find out how to enter for any of the events above please head to the Entry Forms page on our website. If you'd like to know more about Formula Ford in your area please don't hesitate to contact your FFA state representatives. The FFA now has an online archive of photos for all of our members to use. The archive can be found at this link and is password protected. More details will come shortly. We are still uploading photos from previous years into the archive, if you don't find photos of your State Series now they will be uploaded in the coming months. The FFA is now on Instagram. If you are familiar with this social media platform, follow us @FFordAus. For further information about our 50th Anniversary range and download our order form click here. If you have any questions regarding Formula Ford in Australia or any of the above, please don't hesitate to contact our administrator on 0422 840 300.